Broda Machine Company was founded in 1935 by brothers Martin and Walter Broda. The company began in 1935 as a wire coat hanger manufacturing business after Martin and Walter Broda perfected a machine to produce coat hangers. After several years in this business, working from a garage behind their home in Niagara Falls, New York, they would gradually begin to expand into general machining. By the time World War II broke out, Martin and Walter were out of the coat hanger business and full time into production of parts for aircraft, machine guns, and other war related items for companies such as Bell Aircraft, Curtis-Wright, Buffalo Arms and Houdaille Hydraulics. The brothers officially incorporated as Broda Machine Company in 1942, with Martin as president and Walter as vice president. In January 1946, Martin and Walter constructed a new building on the corner of Packard Rd. and Pine Ave. in Niagara Falls NY. The high quality of their machined parts work continued as did their loyal following, with customers recommending Broda Machine to their business associates. In 1968 Broda Machine Company constructed a 10,000 square-foot facility in Niagara Falls, New York. Still in this location today, under under the leadership of Thomas J. Broda, Walter's son, the once small machine shop has grown into a modern, highly technical, CNC facility. The firm to this day continues to produce high quality, limited production parts for area and national customers. The Broda penchant for quality and hard work is displayed in their work and their record of success. 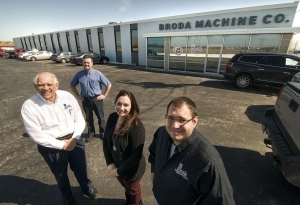 In 2013, Broda Machine Company doubled it's size by expanding to 20,000 square-feet. Along with increased capacity, the additional space will allow the company to introduce more state-of-the-art machining centers. The new machining centers will improve part runtime and allow for the best customer service.